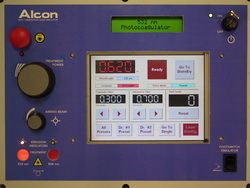 Alcon Labs Case Study - Paragon Innovations, Inc. The first step in accomplishing this goal was to create a platform that would allow designers, clinicians, and marketing to evaluate user interface operation and interaction with external devices. Paragon provided many improvements to the user interface that will improve initial sales. In addition, the customer’s time to market was substantially reduced. A leading supplier of opthalmic surgical instruments was able to refine product requirements and ensure that their next generation product would establish a new standard of care for photocoagulation systems.